I am trying to read your post on procrastination but apparently it is procrastinating because it won't come up. I've been procrastinating all day! It just came up for me.. not sure what the issue is Sue. 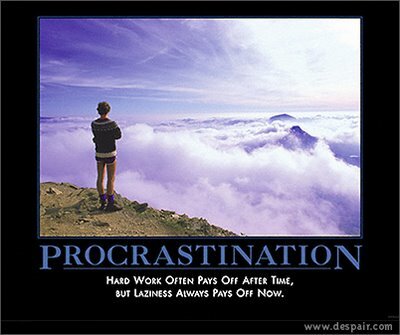 I do tend to procrastinate, but am working at not being a procrastinator. I believe that procrastination, sometimes stems from fear. I know that mine does a lot of the time. I know that probably seems strange. My favorite quote was by Martin Luther.